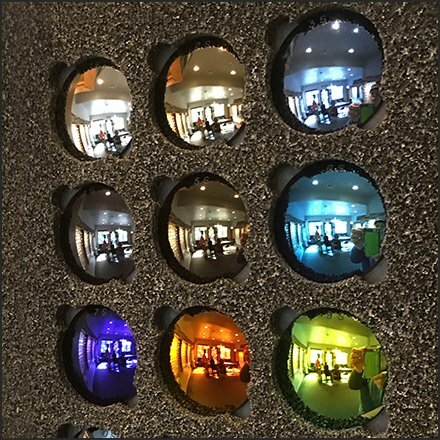 If you want to both look cool and protect your eyes, this Color Sunglass Display By Solar Radiation Control would be irresistible. Here you can browse 23 selections of color sunglass lenses in one small presentation. Solar Radiation Control makes sure to brand one of the lenses pockets so you know exactly who and what to ask for at the service counter. This Color Sunglass Display By Solar Radiation Control seen at Baab Opticians, Mountaintop PA.